Madcap England 'Vitesse' Men's 1960s Mod knitted cycling top in navy. Retro contrast side panels and tipping to the ribbed stand collar and cuffs in ecru really set the garment apart. Fine gauge knitted construction and subtle branded sign off to the left sleeve. 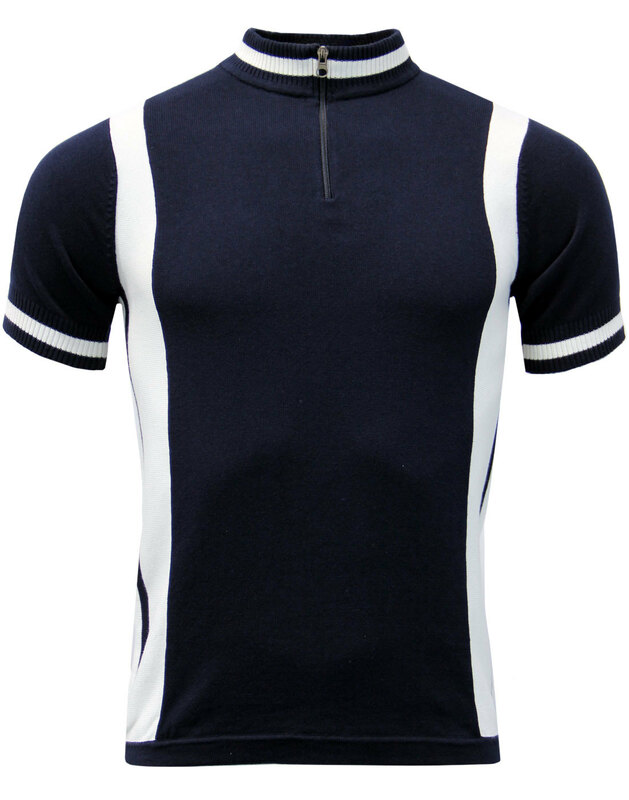 The Madcap England 'Vitesse' Men's Retro cycling top features quarter zip detail and navy speed stripe to the ecru side panel. Stick on The Style Council's 'My Ever Changing Moods' and gear up for a race through the good old British Countryside, or perhaps just a jaunt to the local pub or even a gig! 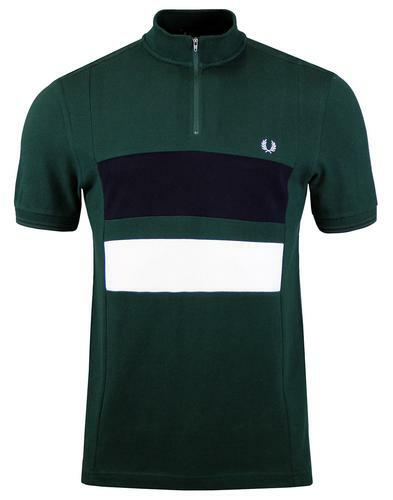 The 'Vitesse' Cycling Top is a Madcap England archive garment re-imagined in a fab new colour palette. 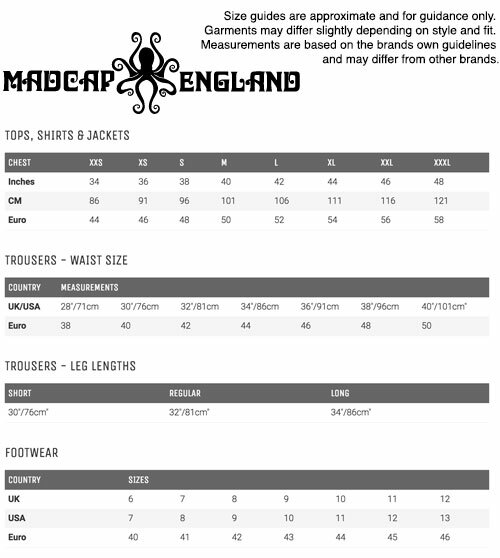 Some time during the 1960s, Carnaby Street legend, John Stephen was asked in an interview what well dressed mods would be wearing this weekend. He premised that they would probably be in a pair of hipster slacks, in either white or blue, and a cycling shirt with zip up to 'here' and stripes down there! So, why not make the Vitesse part of your outfit for this weekend. 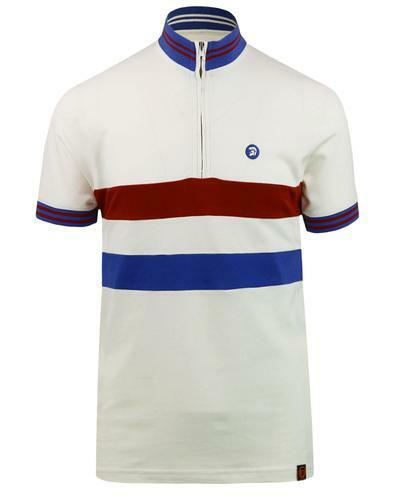 The 'Vitesse' cycling top by Madcap England - Timeless and stylish to the last! 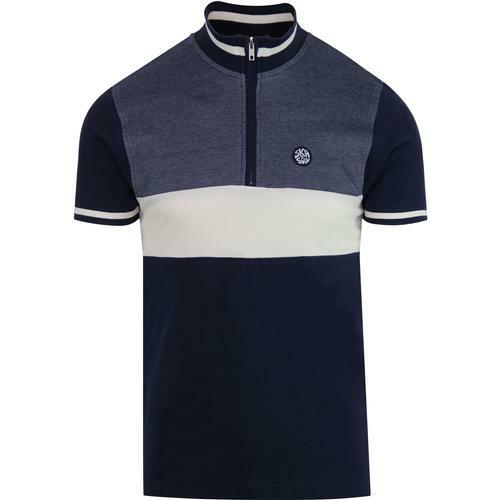 - Madcap England 'Vitesse' men's 60s mod cycling top in navy. - Retro ecru side panels with navy stripe detail. - Ribbed funnel collar with ecru stripe tipping. 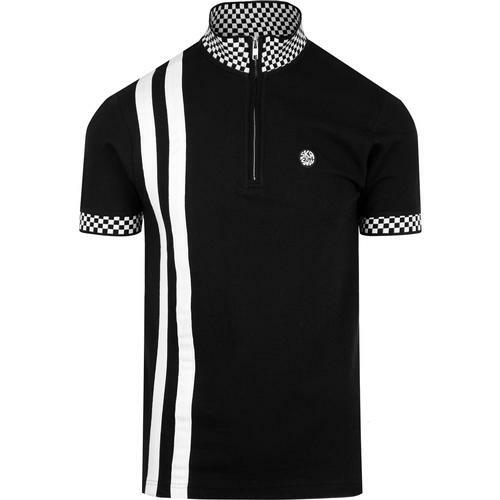 - SKU: MC339 Vitesse Cycling Top.